All students of the third CEMDC course passed final exams in October 2017. The graduation ceremony will be on 30 January, 2018. Study Director: Prof. Sándor Kerpel-Fronius, M.D., D.Sc. As part of the above EU-IMI program initiated with the aim to increase the competitiveness of the European Pharmaceutical Industry, a working contact was established with several universities working in the Central East European Region in 2009 for organizing a joint, post-graduate international medicines development teaching course. The suggested cooperative course will be part of the European Curricula for Global Expertise in medicines development. It will use the harmonized European educational, examination and quality assurance programs which has been developed by the IMI-PharmaTrain cooperation involving the major European course providing universities. Only students with finished primary university education in medicine, pharmacy or life sciences and who have at least one year of working experience in drug development and/or regulation will be enrolled. The outcome will be experts who have a comprehensive understanding of the entire drug development process including discovery, non-clinical and clinical developments, drug formulation, safety and regulatory requirements, pharmacoeconomics as well as marketing and promotion of medicines. Such experts are increasingly needed both for the globally and nationally active pharmaceutical industries and regulatory bodies. This highly specialized, complex program can be offered cost-effectively for smaller nations and/or countries having a relatively small pharmaceutical industry only if the minimal 20 to 30 students per year necessary for maintaining the program are pooled together from several countries into a joint international course offered by several universities in cooperation. Similarly the internationally outstanding educational staff needed can be most efficiently selected from several participating universities and from a broad pool of national experts working in these countries. The added value of the course given jointly by several universities in English language is the multi-national certificate scientifically accredited by the PhT organization which is a guarantee of its broad international acceptance. CEMDC is the member of the PharmaTrain Federation which continues the educational activities of the IMI-PharmaTrain project. CEMDC is a cooperative educational organization based on a multinational university consortium which has been established for post-graduate training in Drug Development Science (Medicines Development Science, Pharmaceutical Medicine) within the IMI-PhT program. The principles of the consortium and the obligations of the partners are defined in a Memorandum of Understanding (MOU) signed by all participating universities and in separate Cooperation Agreements signed bilaterally by Semmelweis University – the Coordinating University entrusted by IMI-PhT – and each Participating University. The CEMDC is directed by a Governing Board (GOBO), in which each Participating University is represented by one local Program Coordinator appointed by that university. Each university has one vote. The Participating Universities will control and manage the CEMDC through their appointed representatives in the GOBO. 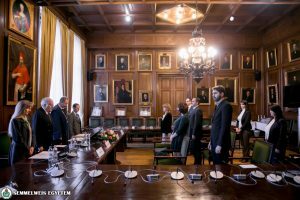 Representatives of the European Federation of Pharmaceutical Industries and Associations (EFPIA), the European Generic Medicines Association (EGA) and the European Medicines Agency (EMA) might be invited, if needed, to participate and serve as counselors in the discussion, without any voting rights. The GOBO decides upon and supervises all educational, financial and administrative activities, centralized advertisements, makes principal decisions in these matters and, finally, evaluates the course performance. The tasks include planning the tuition and other fees, the educational program, the budget required for the organization of modules by the Participating Universities, determining the honoraria, required travel and accommodation support for the Lecturers and management team and, finally, the GOBO accepts the Standard Operating Procedures relevant to the various functions of the CEMDC. These activities are performed in accordance with the MOU and the respective regulations of the Coordinating University. The GOBO must be convened once per year by the Study Director (See point 4.4), who also chairs the sessions. The GOBO has a quorum if at least 50% of the Coordinators are present. The decisions of the GOBO are based on the affirmative votes given by the majority of the university representatives present. If there is equality of votes, the proposal will be rejected. The Standard Operating Procedure of the CEMDC can be changed only with an over 80% majority vote of the Members. 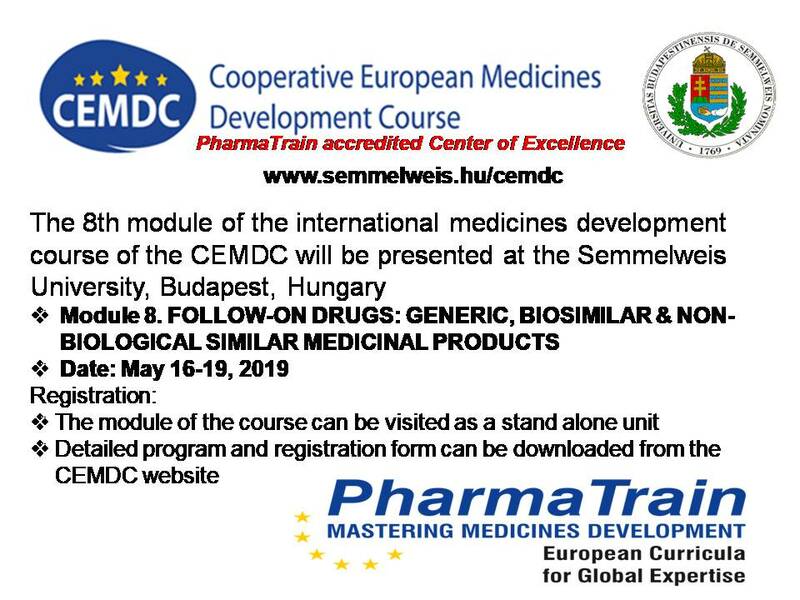 The Cooperative European Medicines Development Course (CEMDC) was officially inaugurated at a ceremony held at Semmelweis University on October 30, 2012. 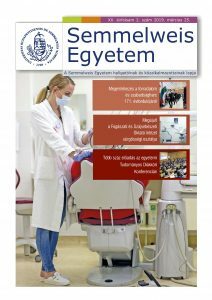 Based on a multinational interuniversity cooperation, the CEMDC aims to provide high quality education in countries where, due to small population size and a relatively minor pharmaceutical industry, the long-term operation of such a specialised programme would be unfeasible without collaboration. A truly European initiative, the ten participating universities are located in ten different nations across Central, Eastern and Southern Europe. The preparatory work, which commenced in 2009, was carried out within the Geographical Extension working group of the IMI-funded PharmaTrain project. “It was a long time of discussions and planning, but good planning is necessary to launch any programme in a successful way,” Dr. Fritz Bühl, Coordinator of PharmaTrain from the University of Basel related, adding that two of the keys to its success were the project’s academic leader and industrial co-leader, Prof. Sándor Kerpel-Fronius (Department of Pharmacology and Pharmacology, Semmelweis University) and Dr. Matthias Gottwald (Vice-President Research Policy and Collaborations, Bayer Healthcare Pharmaceuticals). “This is a complex undertaking and requires a lot of people, so you really need drivers,” he said. The CEMDC is a unique interuniversity postgraduate course, with each of the participating universities having the opportunity to host individual modules. Students taking part in the training are placed into a unified international group, taught by an equally diverse group of instructors. Lecturers may come from either the partner universities or the pharmaceutical industry, thus allowing the CEMDC to choose from a wide array of international experts. 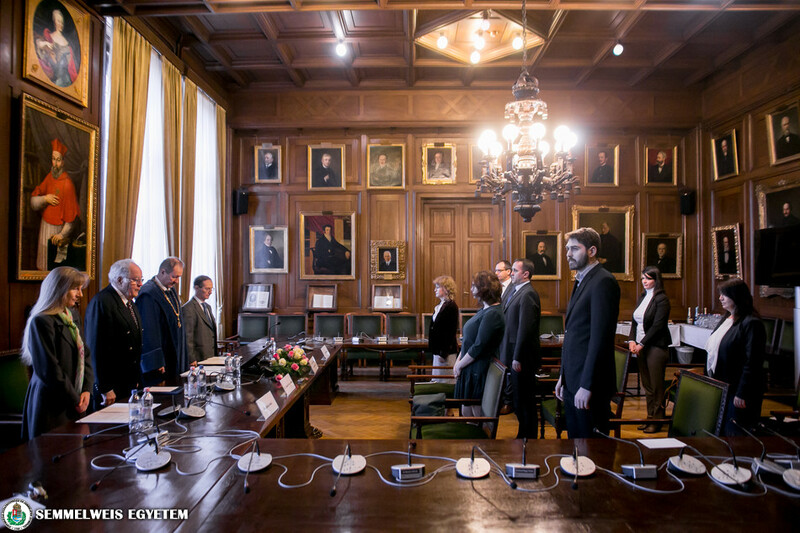 On the 10th October 2013 the absolvents of the first class of the postgraduate course on Medicines Development received their diplomas at the Semmelweis University. The students were of different educational and professional background and have been all working in different areas of medicines development for years. After the certificates have been handed over ceremonial by the dean, Dr. László Hunyadi, the students have been asked about their experience with the course and how they believe they have benefited from the participation. The main opinion was that the course gave a broad overview about the life cycle of a medicine during and after development and helped so to understand the whole process and a prospect into the areas where one is not working on a daily basis. This can be helpful when planning complex operations and programs and to understand the tasks and importance of the other phases. The students also pointed out the great value of the networking possibilities with the other participants and to be part of an „exclusive” group pioneering a novel educational model. Another added benefit was that the language of the course was English and it enhanced the language skills of the attendees. Although some participants already reported to get ahead the diploma will hopefully help to further developments in their career path. The various parts of the website contain information for selected groups of users some of which might be accessed only by specific username and password provided for the expected users. This section contains general information on the CEMDC. In this section administrative and scientific information concerning the program of ongoing or planned courses and/or individual modules to be presented at given dates are collected. Open only for lecturers and Governing Board members of ongoing or planned courses and/or individual modules. The overall aim of this section is to provide a joint discussion platform for the teachers. It should be used primarily for planning the detailed program, for selecting the materials to be presented and discussed, for the preparation of the examination and finally for the general evaluation of the overall teaching performance and educational results with the participation of all the lecturers in a cooperative manner. It is expected to become a well-used forum for exchanging ideas between lecturers of the CEMDC cooperation, for writing comments concerning the planned and delivered programs. CEMDC is member of the PharmaTrain. 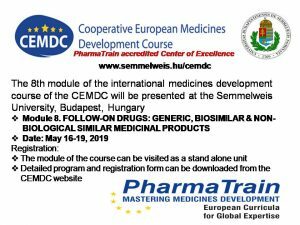 The purpose of this section is to continuously inform both the teachers and students of the CEMDC on the working principles, resolutions and activities of the PharmaTrain cooperation as well as to provide links to the ongoing teaching programs offered by the various PharmaTrain course providers. Open only for the official representatives of the participating universities and invited advisors. This section will be used for presenting and discussing administrative, financial and quality assurance matters of the CEMDC cooperation. The students might obtain academic and administrative information and news concerning their particular course, the list of materials to be studied in preparation for a module and the assignments to be written, the slides of the lectures, the cases discussed and finally the notes received. In addition it will contain a joint discussion platform for the enrolled students and also for alumni of earlier courses. It is expected to become a well-used forum for exchanging ideas between students and lecturers of the CEMDC courses.